Augrabies Falls / Christian Wörtz, Wikipedia Commons, CC-BY-SA-2.5. An unusual and magnificent monument of nature of South Africa is Augrabies Falls. 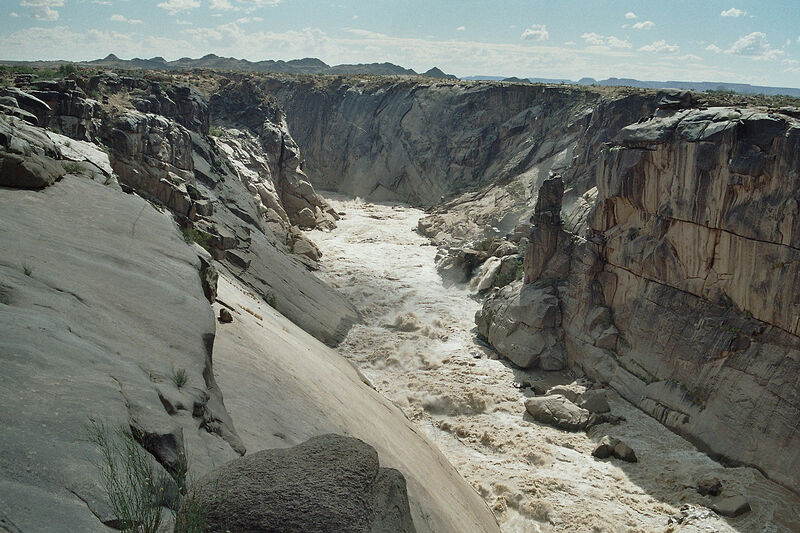 Here the mighty Orange River (Gariep River) plunges into a chasm, forming a waterfall which at high water is one of world’s most powerful and definitely – loudest falls. Local Khoikhoi people named this waterfall Aukoerebies – “place of great noise”. Of course, they knew about it many thousands of years before the arrival of white people. Later Trek Boers changed the Khoikhoi name and now we call it “Augrabies”. This area of Africa by far is not an easy destination for Europeans – climate here is extremely hot, distances – enormous and many early European travelers complained that it is quite hard to get along with Khoikhoi people – not that they were hostile but their language and habits were so different from European languages and habits. The first known European who reached the falls was not like them. He – an adventurous and well educated Swede Hendrik Jakob Wikar – had many friends among local people and eagerly learned about their habits. Wikar reached the falls in 1779, admired the tremendous sound of the falls and also marked the fact that some hippopotamuses and even herds of cattle get caught in the strong current and fall down the falls to their death. Since these times a lot has changed but at the same time – not too much has changed. Falls still are there, nature has been little affected by human activities and, even if there are tourists, this place is a lot less touristy in comparison to Victoria Falls or, God forbid, Niagara Falls. In 1966 around the falls was established Augrabies National Park – comparatively small but charming. It offers many interesting opportunities to enjoy the unusual beauty of this part of the world to its visitors. More troubling is the development of the hydropower plant here. There are plans to construct Riemvasmaak Hydropower Station some 2-4 km above the falls, diverting part of the stream away from the waterfall to a location some 7.5 km below the falls. This would decrease the qualities of the waterfall as well as endanger the biodiversity values of this area. This waterfall has formed on the largest river of South Africa – Orange River (Gariep River). This stream reaches a massif of gneiss, where over the last 1.8 million years the power of water has created 18 kilometers long and up to 240 m deep gorge, widening and deepening the fractures in the rocks. 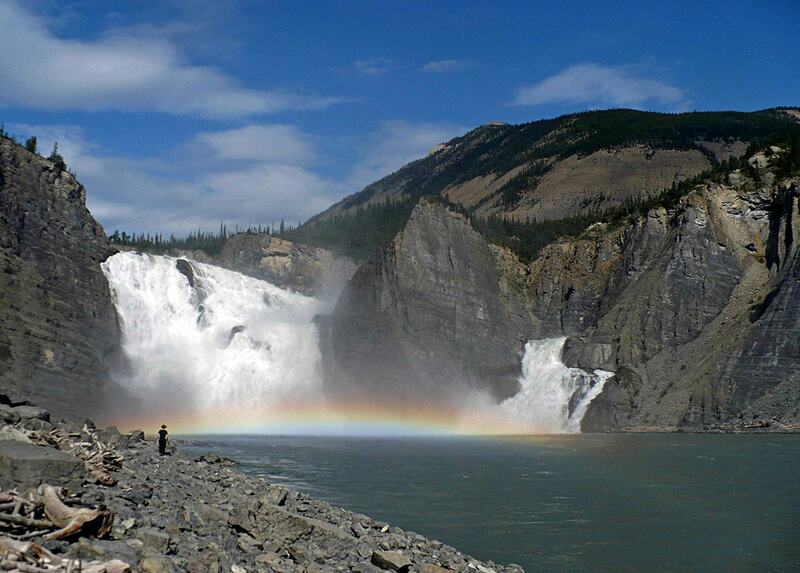 This is an unusually long history for a waterfall – and it continues now. 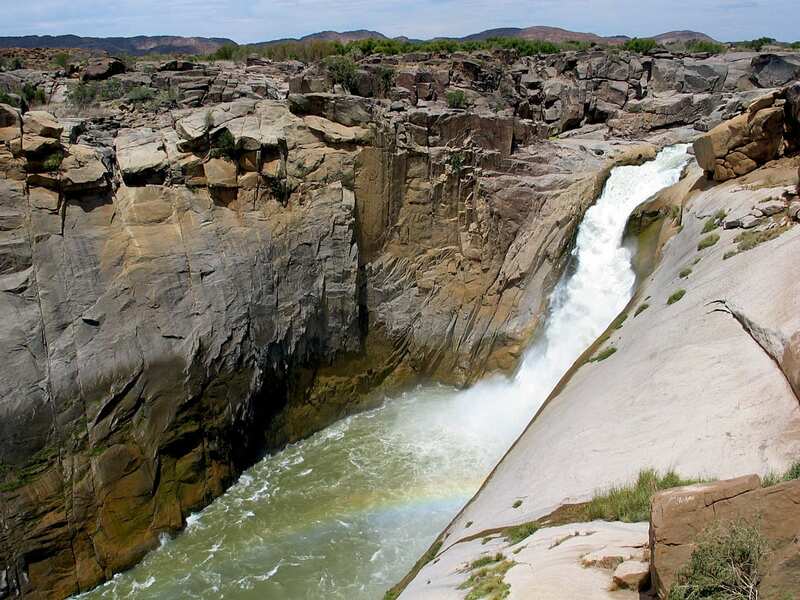 Augrabies Falls are complex – there is the main front of the waterfall but around it are up to 19 smaller falls. At low water these smaller falls disappear – water level does not reach up to them. These falls have their own names, such as Twin Falls, Bridal Veil, Mist Falls, and others. At high water Augrabies Falls have been some of the world’s most powerful falls, with a flow reaching even 7,800 m3 (1988). This surpasses the record flow of the mighty Niagara Falls. At such times the deep gorge is almost filled up and instead of falls here is just a roaring, wild stream with a step in the site of the waterfall. At high water (usually sometimes in November – April) river is brown – it carries lots of sediments. In the dry season, on contrary, the waterfall can become a lot less active, but even then this area has its own, unusual beauty. 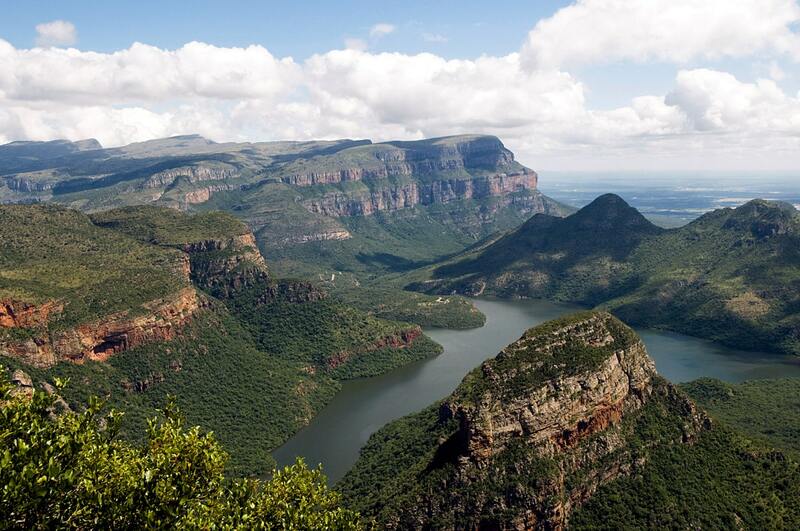 Some 3.2 kilometers to the north-west are located Dry Falls – former waterfall, where at least a part of Orange River fell at high water. Now this plunge for most of the time stands dry. 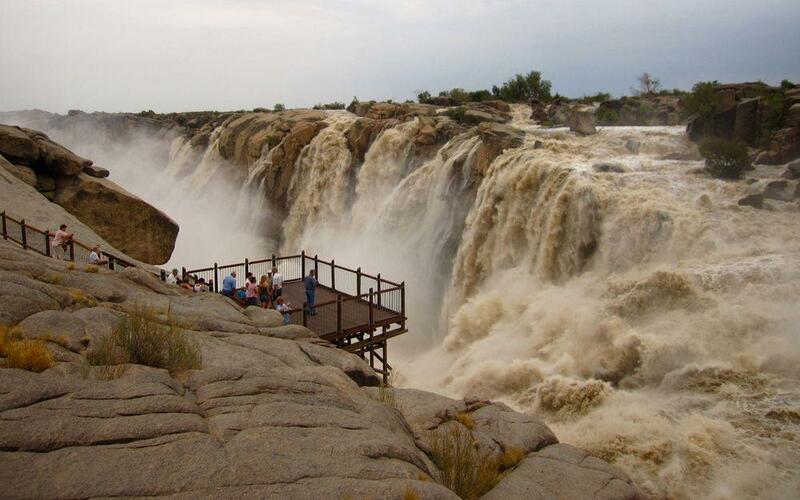 A special feature of Augrabies Falls is sound – this waterfall definitely belongs to the world’s loudest waterfalls. The sound is amplified by the barren, plain walls of the canyon. It is told that in silent nights the falls can be heard 40 kilometers away! It is hard to see the beauty and might of this waterfall in full – there are no suitable locations. Nevertheless, there has been developed a network of boardwalks and the scenery is gorgeous at any time of the year. Around 20 visitors to the falls have died while attempting to reach a better point of view – slopes of gneiss are very steep and at some moment people cannot hold to the ground anymore and slide down in the wild stream. Now the walks are fenced – but one should be careful anyway. There have been found quite many diamonds along Orange River in this region and, according to a legend, the world’s largest cache of diamonds is below the falls. 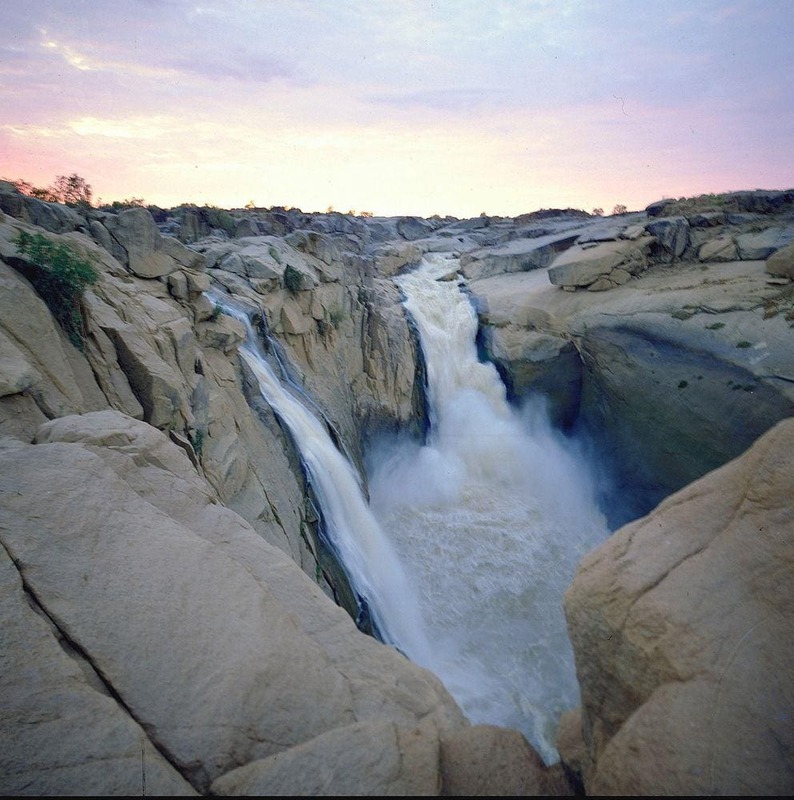 Augrabies Falls, World Waterfall Database. Accessed in 9 February, 2019. Gunnar Broberg. In the Shadow of Thunberg and Sparrman. Hendrik Jacob Wikar at the Cape. Accessed in 9th February, 2019. Visitors to the Augrabies Falls National Park and its environs, known as one of the geological wonders of the world, can now at last enjoy their mysterious attraction to canyon country much more enlightened. “I’ve been craving the road for some time,” writes Justin Fox – odd words for this most seasoned of travel writers. But there is more to it: “Restless, anxious about an uneventful slide into my late 30s …” And thus begins ten thousand kilometres around the edge of the Republic. Hugging the comforts which distance offers agitated souls, he bears east from Cape Town.